In last week’s missive “Bulls Run On Yellen’s Easy Money,” I addressed the breakout and why we increased equity exposure modestly in portfolios. As stated, this analysis is VERY short-term in nature. Price trends are currently positive which keeps portfolios long-biased for the time being. However, while our portfolios are “bullishly” positioned for the short-term, we remain much more pessimistic about the longer-term return dynamics. I want to spend the rest of this weekend’s missive analyzing the ongoing bull thesis that has been pushed out by the media recently. I am not so sure that warning signs weren’t obvious. Starting in mid-2007, the market began to struggle to make gains and initial “sell signals” were given as internal measures began to deteriorate. Furthermore, as shown in the chart below, the “financial crisis” was not a sudden event. Had investors been paying attention to the market, rather than listening to the advice of “buying the dips” or Fed Chairmen declaring “subprime is contained” and “it’s a Goldilocks economy,” there were three separate opportunities to step aside BEFORE the Lehman event ever occurred. Yet, in 2007, much like today, individuals were being told to disregard much of the same evidence that existed then as they are today. Let’s take a look at a few of the arguments being made currently. The problem is 9-months later there has been no advancement on that legislative agenda while the markets have surged more than 18% since the election. As I discussed previously, the market has already priced in the expected earnings growth from the “promised” Trump agenda which puts the market in danger of disappointment. However, as Dr. Lacy Hunt recently discussed, this may not be the case. Another argument often used to support the “bullish” meme is that valuations aren’t as high as they were in 2000. While that is true, there is a vase fundamental difference between now and then. In 2000, as valuations surged toward 42x CAPE earnings, there were MANY technology companies with negative earnings which skewed the valuation measure. Most of the companies are now gone, or the ones that survived finally begin generating earnings. While valuations are NOT a good market timing indicator, and are not predictive of the end of a bull market advance, by all historical measures, they are expensive. Most importantly, while high valuations certainly aren’t predictive of bear market onsets, they are HIGHLY predictive of very low returns in the future. One of the other arguments to justify higher valuations has been that interest rates are so low. 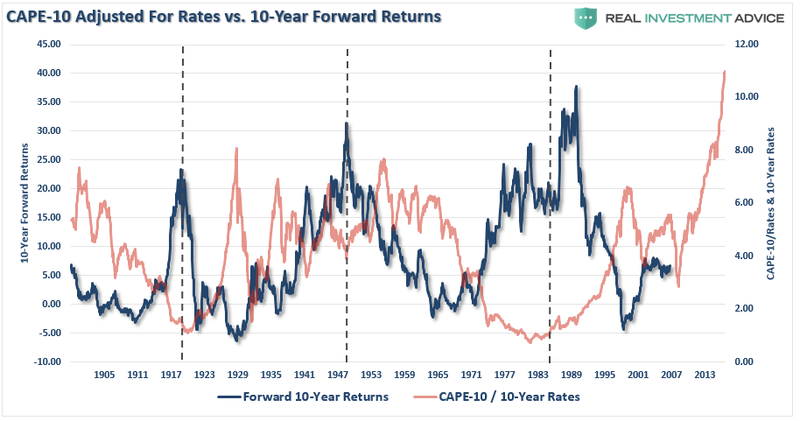 Okay, let’s take the smoothed P/E ratio (CAPE-10 above) and compare it to the 10-year average of interest rates going back to 1900. Importantly, the statement of “lower future returns” is very misunderstood. Based on current valuations the future return of the market over the next decade will be in the neighborhood of 2%. This DOES NOT mean the average return of the market each year will be 2% but rather a volatile series of returns (such as 5%, 6%, 8%, -20%, 15%, 10%, 8%,6%,-20%) which equate to an average of 2%. Of course, as discussed previously, investor behavior makes forward long-term returns even worse. The bulls have continually argued the “retail” investor is going to jump into the markets at any moment which, with all the “cash on the sidelines,” will keep the bull market alive. The chart below suggests they are already in. At 30% of total assets, households are committed to the markets at levels only seen near peaks of markets in 1968, 2000, and 2007. I don’t really need to tell you what happened next. There is no cash on the sidelines. Furthermore, the dearth of “bears” is a significant problem. With virtually everyone on the “buy” side of the market, there will be few people to eventually “sell to.” The hidden danger is with much of the daily trading volume run by computerized trading, a surge in selling could exacerbate price declines as computers “run wild” looking for vacant buyers. This thought dovetails into the “hyperextension” of the market currently. Since price is a reflection of investor sentiment, it is not surprising the recent surge in confidence is reflected by a symbiotic surge in asset prices. The chart below shows the deviation above the 3-year moving average. Importantly, at the peak of the previous two bull markets, the deviation never pushed into the 3-standard deviation range as it is currently. This suggests there is VERY little room left to the upside before some corrective action occurs. There are obviously many more arguments for both camps depending on your personal bias. But there is the rub. YOUR personal bias may be leading you astray as “cognitive biases” impair investor returns over time. Therefore, it is important to consider both sides of the current debate in order to make logical, rather than emotional, decisions about current portfolio allocations and risk management. “So we have a sluggish U.S. economy on our hands with growth revisions to the downside. We have a situation where some investors see the softness enduring long enough that Fed funds futures are now pricing in less than 50-50 odds that Yellen et al make another rate move by year-end. Yet the Fed is signaling that it will begin to shrink the balance sheet by the fourth quarter, with no economic liftoff. The political backdrop is rife with gridlock — unbelievably, there is still hope among investors that tax reform is coming by 2018. At the same time, evidence is mounting that the Dems have a serious shot of taking the House next year. We have a White House that, with the help of inside leaks and the media, continues to find itself embroiled in controversies. And health care reform, which was always pledged to be the first item to be done, is looking more and more like a pipe dream. When hasn’t governing been complicated? It took the Gipper five years and endless bottles of scotch with Tip to get tax reform legislated in 1986! We have heightened geopolitical risks from North Korea and China has instructed the U.S. that it will not be pressured to invoke sanctions against its unstable satellite. Currently, there is much “hope” things will “change” for the better. The problem facing President Trump, is an aging economic cycle, $20+ trillion in debt, an almost $700 billion deficit, unemployment below 5%, jobless claims at historical lows, and a tightening of monetary policy and 80% of households heavily leveraged with little free cash flow. Combined, these issues alone will likely offset most of the positive effects of tax cuts and deregulations. Furthermore, while “bearish” concerns are often dismissed when markets are rising, it does not mean they aren’t valid. Unfortunately, by the time the “herd” is alerted to a shift in overall sentiment, the stampede for the exits will already be well underway. Importantly, when discussing the “bull/bear” case it is worth remembering that the financial markets only make “record new highs” roughly 5% of the time. In other words, most investors spend a bulk of their time making up lost ground. And Wall Street needs you to “buy” so they have someone to sell their products to. With everyone telling you to “buy” it is easy to understand why individuals have a such a difficult and poor track record of managing their money. Trying to predict the markets is quite pointless. The risk for investors is “willful blindness” that builds when complacency reaches extremes. It is worth remembering that the bullish mantra we hear today is much the same as it was in both 1999 and 2007. Again, I don’t need to remind you what happened next. While the markets broke out to all-time highs this past week, that breakout was not uniform across the market. Technology, Materials, Financials, Health Care, and Industrials all hit new highs this week. However, the action faded a bit on Friday as the momentum of the advance began to wane. Staples, Utilities, and Discretionary improved but failed to set new highs. Utilities had strong performance as bond rates fell pushing interest rate sensitive issues higher. The energy sector rallied this week above the 50-dma which presented a good opportunity to sell energy related exposure before closing back below resistance on Friday. With the OPEC oil deal now likely falling apart, something I suggested would happen earlier this year, oil prices crashed on Friday reinforcing resistance at $48. Small and Mid-Cap stocks regained their respective 50-dma’s which removed their warning signs previously. This week, however, they both broke out of their long consolidation ranges pushing higher. Stops have now been moved up to the previous lows. Emerging Markets and International Stocks as noted last week the bullish “buy point” occurred which allowed us to add international exposure to portfolios. However, the subsequent explosion of these sectors higher reduces the opportunity somewhat until there is some correction to work off the excessive overbought condition. Patience for now. Gold – is once again trying to muster a rally from extremely oversold conditions. There is a good bit of work to do before this sector becomes interesting, but the move last week above the 200-dma does put the commodity back onto our radar for now. S&P Dividend Stocks, after adding some additional exposure recently we are holding our positions for now with stops moved up to recent lows. With the sector becoming overbought, wait to add new exposure until a better opportunity presents itself. Bonds and REIT’s the recent sell-off in these sectors to long-term support provided the “reasonable opportunity to add bond, and interest rate sensitive, exposure to portfolios opportunistically.” With additional exposure working well last week, we will wait and see what happens next before making any further changes. The bullish trend remains positive, which keeps us allocated on the long side of the market for now. However, more and more “red flags” are rising which suggests a bigger correction may be in the works over the next couple of months. Two weeks ago, during the correction, we added modestly to our core holdings for the second time this year. However, we are still maintaining slightly higher levels of cash currently. With the breakout of the market on last Friday, we are again adding to our portfolio positions and increasing exposure again this coming week. We also added to our bond holdings as well last week as rates hit our buy targets. Last week, I increased the 401k model up to 100% because the market broke out on a technical basis, and I did so with a high degree of concern. “THERE IS NO REQUIREMENT YOU DO ANYTHING. However, with that said, I did adjust the model to reflect the current “break out” of the market and increased exposure accordingly. This is not a market currently to be trifled with as the overbought and overly bullish conditions remain at extremes with investors chasing momentum with complete disregard to the underlying risk. However, the markets are advancing and the push higher this week confirmed the breakout. Furthermore, we also added bond exposure to portfolios as well. Importantly, there is a high degree of correlation between all asset classes. This is particularly disturbing as such a degree of correlation suggests that diversification will not shield investors against losses. This is why we continue to reiterate a regular reassessment of portfolio related risk and positioning.